British Prime Minister Theresa May has called an emergency cabinet meeting for tomorrow to discuss the crisis over Syria. It comes as US President Donald Trump signalled the United States was ready to launch air strikes against the Syrian regime. Mrs May has called senior ministers to gather in Downing Street tomorrow after declaring "all the indications" were that the regime was responsible for a chemical strike on its own people last weekend. She has said the UK will coordinate its response to the incident in the rebel-held town of Douma - where at least 40 people are reported to have been killed - with the US and France. At the same time, she is under pressure to give parliament the chance to vote before committing UK forces to any new action in Syria, amid fears it could draw the West into direct conflict with President Bashar al-Assad's main backer, Russia. In a sign of his growing impatience for action, Mr Trump tweeted a warning that air strikes were imminent, saying the missiles "will be coming". In a follow-up tweet, Mr Trump said that relations between the US and Russia are worse now than ever, adding "that includes the Cold War". Russia has said it hopes all sides involved in Syria will avoid doing anything that could destabilise an already fragile situation in the Middle East and has made clear it strongly opposes any US strike on its ally. Meanwhile, the United Nations Security Council will meet behind closed doors tomorrow to discuss the threat of military action against Syria. Bolivia, one of ten non-permanent council members and a strong supporter of Russia, requested the meeting to address "the recent escalation of rhetoric regarding Syria and the threat of the use of unilateral actions," according to the request sent today. Tomorrow's meeting will be held immediately after a briefing on non-proliferation of weapons of mass destruction, which is scheduled for 3pm Irish time, diplomats said. The Security Council failed yesterday to agree on setting up an investigation of chemical weapons use in Syria, with draft resolutions from Russia and the United States defeated in three votes. Russia used its veto to block a US-drafted measure, while two other proposals from Russia failed to garner enough votes for adoption. The United States is consulting the UK and France about a possible military response to the suspected chemical attack. US Defense Secretary Jim Mattis said that the Pentagon was ready to provide military options. After the three failed votes at the council yesterday, Russian Ambassador Vassily Nebenzia implored the United States to change course. "I would once again ask you, once again beseech you to refrain from the plans that you are currently developing for Syria." Russia warned that Western military action in Syria would be illegal and could lead to a wider conflict. The Irish Syria Solidarity Movement held a protest over the latest developments in Syria outside the Dáil this evening. Members said they were demonstrating against what they described as the crimes perpetrated by President Assad against his own people. With tension mounting, pan-European air traffic control agency Eurocontrol warned airlines to exercise caution in the eastern Mediterranean due to the possible launch of air strikes into Syria over the next 72 hours. Eurocontrol said that air-to-ground and cruise missiles could be used within that period and there could be intermittent disruptions of radio navigation equipment. Both Russia and Iran, Bashar al-Assad's other main ally, have warned his enemies against military action in recent days, underlining their commitment to the Syrian government they have armed and supported through years of conflict. The Hague-based Organisation for the Prohibition of Chemical Weapons said Mr Assad's government had been asked to make necessary arrangements for an OPCW investigation team to visit shortly. The mission will aim to determine whether banned munitions were used but not assign blame. The Assad government and Russia both urged the OPCW to investigate the allegations, a move by the two countries that was apparently aimed at averting any US-led military action. A European source said European governments were waiting for the OPCW to carry out its inquiry and for more solid forensic evidence from the attack to emerge. The World Health Organization has demanded "immediate" access to the victims of an alleged chemical weapons attack, voicing indignation at the strike that caused symptoms consistent with exposure to toxic substances. "We should all be outraged at these horrific reports and images from Douma" where Saturday's attack took place, said Peter Salama, the UN agency's chief of emergency response. "WHO demands immediate unhindered access to the area to provide care to those affected, to assess the health impacts, and to deliver a comprehensive public health response." Citing information previously released by local health organisations, WHO said that "an estimated 500 patients presented to health facilities exhibiting signs and symptoms consistent with exposure to toxic chemicals". "There were signs of severe irritation of mucous membranes, respiratory failure and disruption to central nervous systems of those exposed," it added. WHO also said that more than 70 people sheltering from bombardment in basements in the former rebel pocket of eastern Ghouta, where Douma is located, were reported to have died. It said 43 of those deaths were "related to symptoms consistent with exposure to highly toxic chemicals," citing reports from its local health partners. 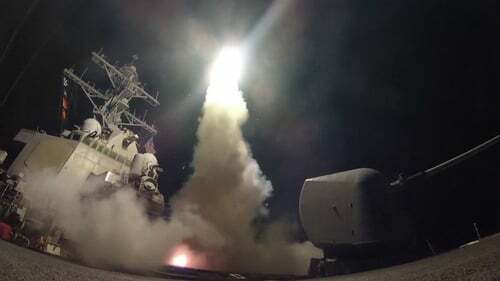 The United States, Britain and France have argued the incident bears all the hallmarks of a strike ordered by Mr Assad. The Syrian government and Russia say the reports are bogus. Mr Assad has been blamed for previous attacks by the OPCW and UN-backed war crimes investigators. WHO has delivered medicine capable of treating certain types of chemical agents to clinics through a series of humanitarian convoys deployed across the country in recent years. UN officials have also accused President Assad's troops of at times removing those treatments from humanitarian vehicles. Syria's army has evacuated key defence buildings in Damascus over fears they might be targeted by Western strikes in response to an alleged chemical attack, a monitor has said. "The buildings of the ministry of defence and the army headquarters have been empty for two days," the Syrian Observatory for Human Rights monitoring group said. Regime forces have also evacuated military airports as well as the bases of the elite Fourth Division and Republican Guard outside the capital, the Observatory said. There was no immediate confirmation from the Syrian government.